Corey Pavin spent over 150 weeks in the top-10 of the Official World Golf Rankings between 1986 and 1997. He topped the PGA's money list in 1991, when he was the last man to achieve this without winning at least one million dollars in prize money. Pavin's success culminated in his only major victory, the 1995 U.S. Open. Pavin played on three Ryder Cup teams: 1991, 1993, and 1995. 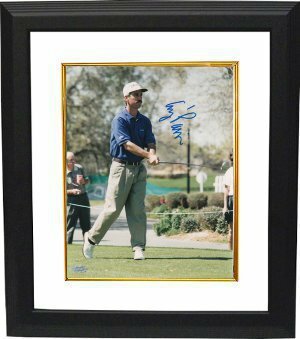 Corey Pavin has hand autographed this 8x10 Color Photo. Mounted Memories Hologram and Certificate of Authenticity. Custom White Mat and Black Color Framed as shown.